Flannel Friday: Who Gathered Eggs From The Chicken Coop? Man I can’t keep my dang promises! I’ve keep saying I’ll get back into a regular blogging schedule. I promised to write a love letter to my precious BookScan Station. I promised I’d write more about Bibliobop. But things have been shifting around, and i’ve been feeling a bit half-baked in the brain department. We had a Busytown Community Helper event. We set up a bunch of stations where the kids met a nurse, a police officer, a newpaper reporter, and a yoga teacher. We had a few other community helpers slated to participate, but they backed out, so we had to put together a few extra activities the week of the event. The fabulous Ms Arianne Carey made a very cool farm station where the kids made a felt farm, collected vegetables according to a recipe, and gathered eggs from a chicken coop. 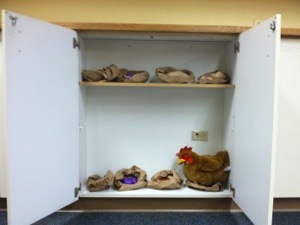 She used butcher paper to make the nests, and arranged them on a bookshelf so it looked like a little chicken coop. Then she placed several egg shakers in each nest, and put our hen puppet for that added bit of authenticity. 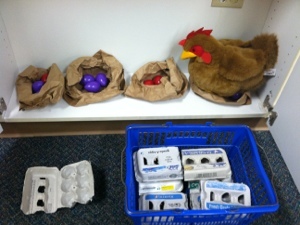 When the kids came in they grabbed an egg carton, and gathered eggs from the nests. Isn’t she brilliant? Anyway, the following Tue, I was planning a farm storytime, and realized it would make an awesome activity. I set it up in a cabinet, closed the doors. Halfway through the storytime, I told the kids about the storytime farm. When I opened the cabinet, the kids gasped in wonder. Who gathered eggs from the chicken coop? Antoni picked 2 eggs from the chicken coop! Anyway, it was super fun. Happy Flannel Friday! Sharon is hosting at Rain Makes Applesauce! Love the chicken coop rhyme and idea. I will use this with my preschoolers. They will love this!! Thank you for your post. I used this idea, but changed it a little. I used a box on its side for the chicken coop and shredded brown wrapping paper for the straw. The eggs were under the “straw” and as the children came up to gather two eggs as we said the rhyme you included in your post. It was a hit. Thanks again.